When everyone was posting photos of their Dad. 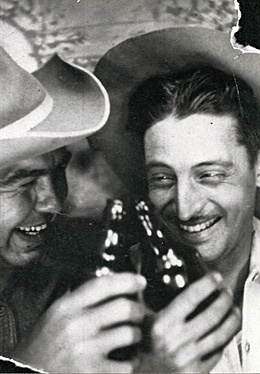 I found this old one of my Dad and one of his buddies in Socorro NM celebrating about 1933. I loved my dad more than I can express. He died 20 years ago. But that day, memories were afloat. Mom always said I was so much like him. Maybe yes. I hope so. He gave. He helped. He laughed. He did not hold grudges. I never heard him complain. When he did complain, it was like a problem to be accepted and then work on. On this Father's day Mom had fallen and struggled to reach a phone. At age 94, she lived by herself, with only a ride to the hairdressers and grocery shopping.She went to an Emergency room and then later a Rehab facility. For years, my brother and I suggested, not demanded, an assisted care type retirement center. She called us names, made accusations, would not even go to an Open House at such places. Now she can't walk. Now my brother and I say, NO. You can't live alone anymore. You can't crawl to a phone all alone when you fall. The first falls were minor. Now it is on the charts. Mom is shy and she is ornery all at the same time. She realizes the situation. Most of the nurses and aides are black. First day at the hospital, Mom says to a Nurse. "You are black." The nurse responds back. "Yes, I am." When they got to the rehab center, all the aides and nurses (mostly) were Afro-American in some way, if not Haitian with accents. And Mom warned them. "I can get very mean sometimes." And they look at her. "We understand mean. It is okay." And years ago, when I was just ready to never to speak again to my Mom over something, my Dad said, "You will see, there is a sweet person in there..."
Oddly, the sweet person is emerging. Most of Mom's burden has fallen to my brother and his wife in Indianapolis. I don't want to live in Indianapolis. I offered Mom Kansas and she said no. Both my brother and I remember....This is our dad's sweetheart. The one he came back to marry. There is a photo somewhere taken along the Wabash River in Vincennes Indiana beneath a NM sarape.